PRESS RELEASE: Fender introduces a replica of the starred-and-striped Stratocaster guitar that infamous MC5 guitarist and Detroit proto-punk Wayne Kramer used back in the late 1960s and early 1970s to kick out the jams and kill hate. 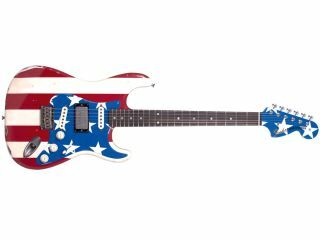 It bears his distinctive US flag finish, with a red-and-white striped body and white-stars-on-blue-background pickguard and headstock. "I figured my motif could be the American flag, the stars and stripes, and so I decided to paint my guitar in that color scheme to advertise my patriotism and total opposition to the direction the country was going in 1968." Special features include a roaring Seymour Duncan '59 humbucking middle pickup and a commemorative neck plate engraved with "This Tool Kills Hate." Other features include an alder body, lacquer body finish, maple neck with C shape and large '70s-style headstock, 21-fret rosewood fingerboard with 7.25" radius and vintage-style frets, vintage-style single-coil Stratocaster neck and bridge pickups, American Vintage hard-tail string-through-body bridge, Fender/Schaller vintage-style 'F' tuners and chrome hardware. Deluxe gig bag included. Information taken from the Fender website. For more, visit Fender.com.